It has already been a year since Google announced the mighty Nexus 7 and now we are looking forward to its next version. There has been quite a few discussions about the specs of the upcoming device, don’t know what it will be called yet but we can be sure that it will be one fine product. The only question that is currently hot now is about the price tag. Will it still be marked at $200? We can forget about that right now and move on to a hot news sweeping across the cyberspace – the updated specs of the new Nexus 7, not from any leaks, but from ASUS themselves (kinda). We should still tag it as a rumour because the whole scenario seems a bit weird. 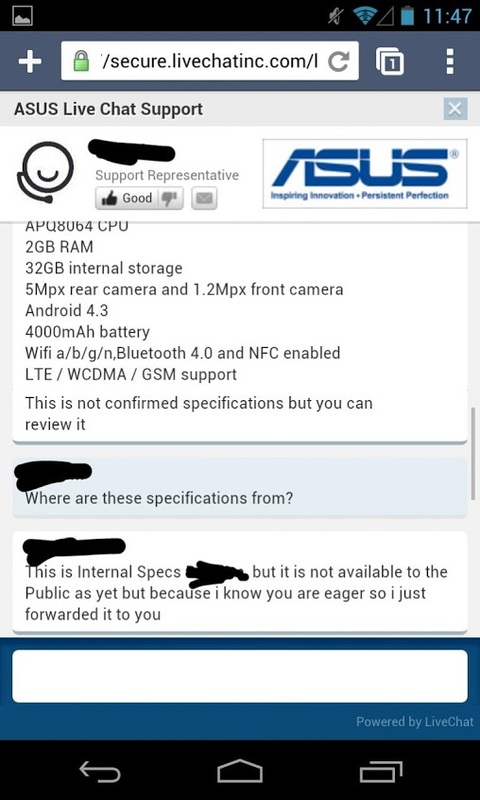 A Reddit user(iopjklohyeah) has posted pics on a conversation he had with an ASUS representative who has openly revealed the tech specs of the next iteration. How did it all go? There was no persuasion or begging of any kind but just a simple question and boom, there’s the answer. Some say it’s an automated answering system or a photoshopped picture but judging from the nature of the conversation that doesn’t seem so. Let’s imagine this to be a legit information. 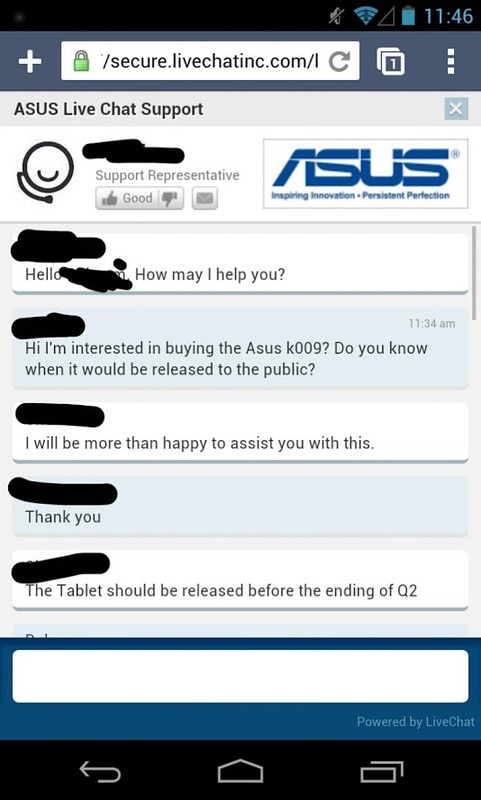 Here, as you can see from the photos below, the user asked about the expected release of Asus K009 which is supposedly the code for the next version of Nexus. 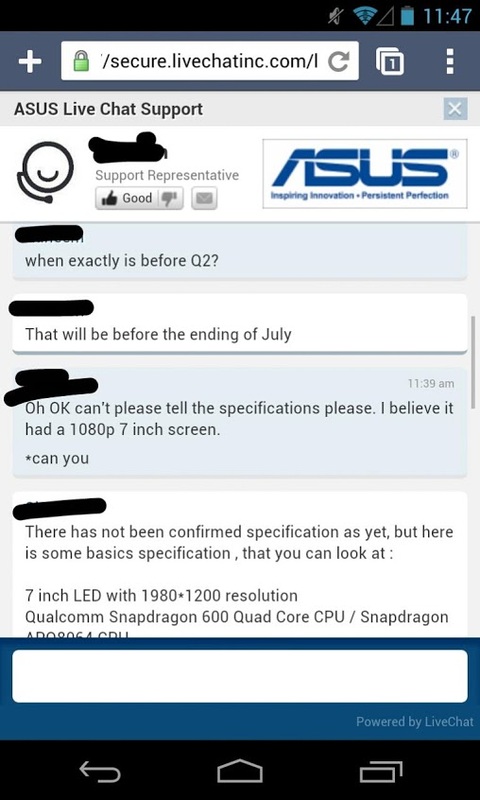 The representative, without any hesitation, replied by saying that it would be available at the end of July and later on gives out the possible specs of the device. Now here might be two cases, a) the representative just copied the specs from a blog to play around or b) the representative was foolish enough to give out such delicate information. It is somewhat confirmed that the new device would have a rear camera. Personally, I never liked having a rear camera but recently I began to understand it’s necessity like taking class notes from the board, taking a picture when you don’t have a camera and situations like that. So in my point of view, the price will not drop or stay the same rather increase to $230-$250 range. If its priced below, then it’s going to be a steal! How Serious is Online Video Game Piracy? I’m really looking forward to this device and hope the specs that have been published are accurate. If so, this could be a stunning tablet and a real step forward for Android on tablets.